Optimization of the dual system, LMRP Cap and the Q4000 Direct Connect, will continue over the next few days. For the first 12 hours on June 17 (midnight to noon), approximately 8,000 barrels of oil were collected and approximately 4,500 barrels of oil and 25.8 million cubic feet of natural gas were flared. On June 16, a total of approximately 14,750 barrels of oil were collected and approximately 3,850 barrels of oil and 40 million cubic feet of natural gas were flared. That means that oil recovery from the well, which is the usm of that collected and that flared is now reaching a level of 25,000 bd. The capacity of the current system is around 28,000 bd, beyond which they will need to wait for the change in vessels, risers and for the new cap now planned for the end of the month. This will mean that the Q4000 will be disconnected, and control of the valves at the BOP also transferred. Although it is difficult to tell from the ROV feeds, it appeared earlier that the venting ports at the top of the LMRP cap might have been closed, so that BP are now much closer to capturing all the oil and gas leaking from the well. 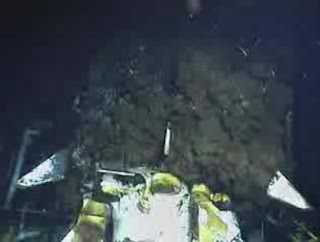 The feed from the Skandi ROV1 for example seems to have more gas in it than previously. Similarly at the time this was written the vertical feed into the DP at the top of the cap can be seen, from the Enterprise ROV2 feed. There were five questions that Mr. Hayward was warned that he would be asked about, before he appeared before the House Energy and Commerce Subcommittee on Oversight and Investigations. However while the committee obviously focused on the events at the particular well (Mississippi Canyon 252 – the Macondo well ) which had the disastrous failure, they seemed to find it difficult to accept that, prior to the disaster, and with BP drilling hundreds of wells a year, the CEO’s only knowledge of the well had been that he had heard that it was a successful discovery. Congressman Waxman, for example, dwelt on the ignorance of BP top management about the well. You are the CEO, so we considered the possibility that you may have delegated the oversight responsibility to someone else. We reviewed the e-mails and briefing documents received by Andy Inglis, the chief executive for exploration and production, and Doug Suttles, the chief operating officer for exploration and production and the person now leading BP’s response to the spill. According to BP, these are the senior officials who were responsible for the Macondo well. But they too were apparently paying no attention. We could find no evidence that either of them received any e-mails or briefings about the Deepwater Horizon rig or the drilling activities at the well.  They disregarded questionable results from pressure tests after cementing in the well.  BP selected the riskier of two options for their well design. They could have hung a liner from the lower end of the casing already in the well and install a “tieback” on top of the liner, which would have provided additional barriers to a release of hydrocarbons. Instead they lowered a full string of new casing, which took less time and cost less, but did not provide the same protection against escaping hydrocarbons.  BP chose not to fully circulate the mud in the well from the bottom to the top, which was an industry recommended best practice that would have allowed them to test for gas in the mud.  BP chose not to use a casing hanger lockdown sleeve, which would have provided extra protection against a blowout from below. In his written response, Mr. Heyward first addressed the processes that BP are going through to address the current problems (cutting off the oil flow to the Gulf, cleaning it up and compensating those who have been damaged and economically impacted). He pointed to seven areas in which BP have focused their inquiries into the incident. 6. The automatic closure of the BOP after its connection is lost with the rig; and; 7. Features in the BOP to allow ROVs to close the BOP and thereby seal the well at the seabed after a blowout. The video of the testimony is available from the Subcommittee website. In his opening questions Congressman Waxman noted that the BP decision to use a single production casing was rebutted by the heads of the other large Oil Companies who had earlier testified before Congress. The reason being that it provided “”an unrestricted pathway for gas to travel up the well through the annular space that surrounded the casing, and of course, it blew out the seal.” Mr. Heyward pointed out that this was the original design for the well, and that it had been approved by the MMS. There was then a debate as to whether a long string, or a 7-inch liner would be most appropriate. The decision to use the long string was based in part on the long term integrity of the well. Congressman Waxman pointed to a BP memo which included that the use of the long casing consequence would include that “it is unlikely to be a successful cement job, and that it would provide an open annulus to the wellhead.” In contrast the use of the 7-inch liner would largely obviate these risks. When Mr Heyward tried to answer that the Congressman cut him off and accused him of stonewalling, refusing to accept that the decision was made based on an engineering judgment – which was the point that the CEO was trying to make. Mr Hayward tried to make the point that the long casing was not an unusual design in the Gulf of Mexico wells, to which the Congressman responded with Halliburton testimony that it was only used in 2 – 10% of the wells, and when My Hayward said that he would not personally judge which decision was correct, which the Congressman found unacceptable. It was that sort of a day for the BP CEO and the full video of the investigative hearing can be downloaded, as I noted. As the above exchange illustrated, there was not a lot of useful new information that came from the afternoon (though I must admit I had other things to do and did not watch most of it). The hearing was yet more evidence that the Congress of the United States is even more dysfunctional than The Company Formerly Known As British Petroleum. Once CEO Hayward told the Committee "It was not me, gov", they should have focused on questions about what actions (if any) he has taken since he became CEO to get the message out to his entire 100,000 staff that safety always takes priority over cost-control. But that would have required Congressmen to think, not just posture. I get the suspicion that BPs ultimate defense is going to be "engineering judgement" where they can make some form of a case to defend every decision individually in a string where the ultimate combination was contributory to the disaster. There's certainly a case for "engineering judgment", taking the decisions independently. But not for the combined sequence of events. Take the decision to go ahead with the 6 centralizers on the rig, and not wait for 15 others to be delivered as Halliburton recommended. Time is money on a $1 Million/day rig, so it was perhaps a reasonable engineering judgement to take the risk that the cement job with only 6 centralizers would be poor. But then it should have been automatic to follow up with a Cement Bond Log, to see whether immediate remediation was necessary to leave the well in a safe condition. I think we saw BP's defence strategy at Hayward's hearing. One part is "Wasn't me, gov." BP executives will dig deep enough into the organization to find one of the Chairman's "small people" and blame the whole thing on him. Probably some guy who was just trying to make a name for himself in the only way the BP culture (created by Hayward) admires -- aggressive cost containment. The other part of the defence -- MMS approved everything BP did.